The conditions for an alerting policy define what is monitored and when to trigger an alert. For example, suppose you want to define an alerting policy that emails you if the CPU utilization of a Compute Engine VM instance is above 80% for more than 3 minutes. 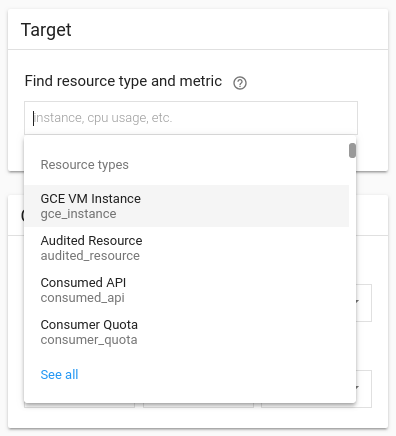 You use the conditions dialog to specify that you want to monitor the CPU utilization of a Compute Engine VM instance, and that you want an alert to trigger when that utilization is above 80% for 3 minutes. The Title field is a required field. As you complete the fields in the conditions dialog, the title field is automatically populated. You can change the auto-populated content to something more meaningful to you. A metric condition is defined by a resource type and a metric. An uptime-check condition is defined by a resource type and an uptime check. A process-health condition is defined by a resource type and a series of filters. After you select the type of condition, you use the fields in the Target pane to define values for the condition's fields. For example, if you select a metric condition, the target pane includes list boxes for the resource type and metric. See Using custom metrics for details on how to create your own custom metrics. 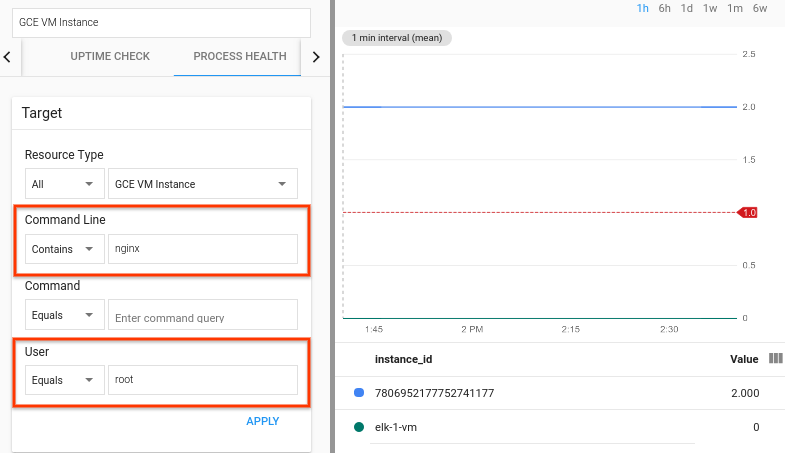 See Overview of logs-based metrics for details on how to create metrics based on the content of log entries. See Sample policies for alerting policy samples and for representing alerting policies in JSON format. 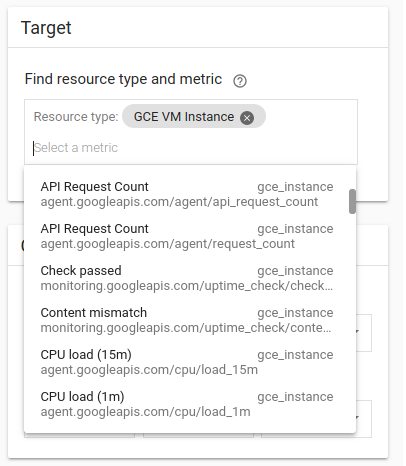 We recommend creating an alerting policy for an uptime check from the Monitoring > Uptime checks page. In this case, the condition fields in the alerting policy are populated for you. See Alerting on uptime checks for details. Click the Process health tab. In the left drop-down list, select a single resource, a group of resources, or all resources. In the right drop-down list, select the resource type you want to monitor. For example, you might select Compute Engine VM Instance. The UI provides the list of available resource types for your system. For the Command Line, Command, and User filters, select the fields to identify the processes that you want to monitor. In these filters, the left drop-down list selects the string-match operator and the right field specifies the query. The string-match operators are: Equals, Contains, Starts with, Ends with, and Regex. The operations are case sensitive. The syntax of the query depends on the operation choice. You can use wildcard operators in queries. For example, the wildcard * matches any process. If you don't specify the query value for any of the filters, then all processes are counted. If you enter a query for one filter, only processes that match the filter are counted. If you enter command-line and command queries, processes that match either filter are counted. If you enter a user query, processes that match the user filter and the command-line-or-command filter are counted. In the Resource type left drop-down list, select All, and for the right drop-down list, select Compute Engine VM Instance. In the Command Line left drop-down list, select Contains, and for the right field, enter nginx. Leave the Command right field empty. In the User left drop-down list, select Equals, and for the right field, enter root. In the preceding figure, the graph shows an alerting threshold of one process and data for two instances. One instance has no processes that meet the filter conditions, and the other instance has two processes that meet the filter conditions. 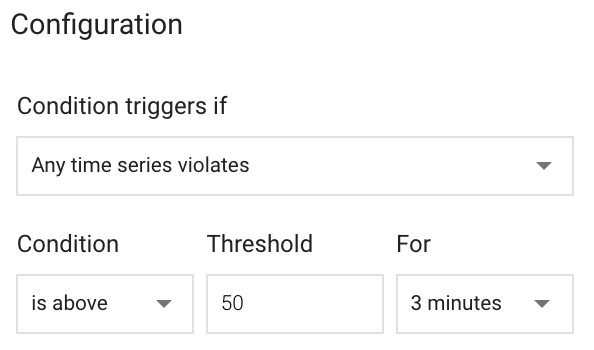 You use the Configuration region to define when the alerting policy triggers. The configuration region defines which time series can cause an alert to trigger and when these time series aren't meeting the policy. In the Threshold field, enter 50. In the For drop-down list, select 3 minutes. To complete the definition of your condition and return to the alerting policy dialog, click Save.